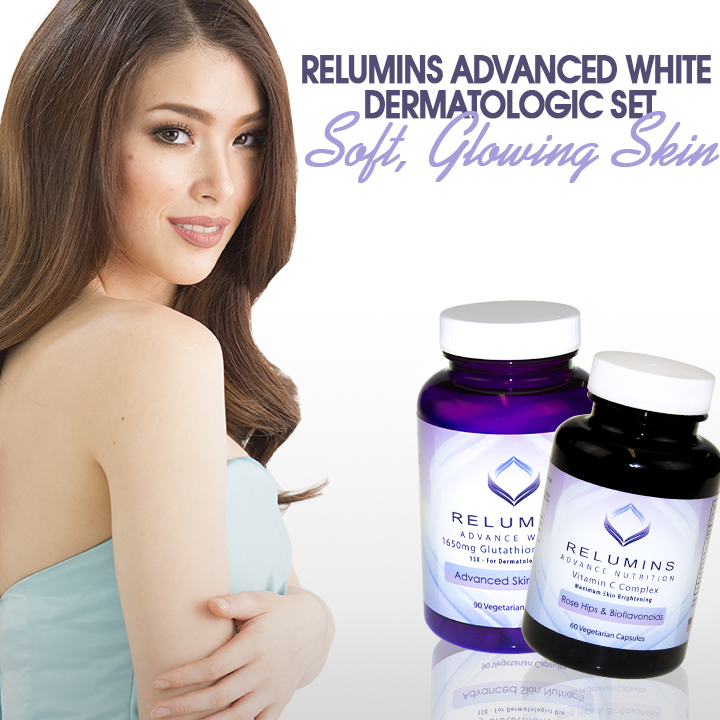 Relumins Advanced White Dermatologic Set - 1650mg Glutathione Complex and Advanced Vitamin C with Rose Hips and Bioflavanoids (1 Month Supply) - Cutting Edge Formula, Unbelievable Results! 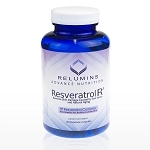 Glutathione, Vitamin C, and 15x Boosters To Give You Amazing Results! 665 points will be rewarded to you when you buy this item. 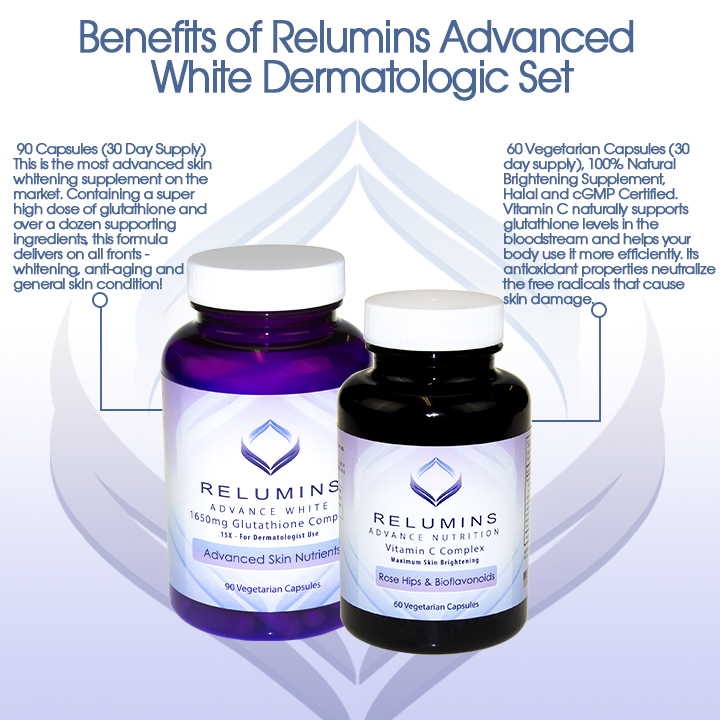 Advance White 1650mg Glutathione Complex - 15x Dermatologic Formula with Advanced Skin Nutrients- 90 Capsules (30 Day Supply) This is the most advanced skin whitening supplement on the market. 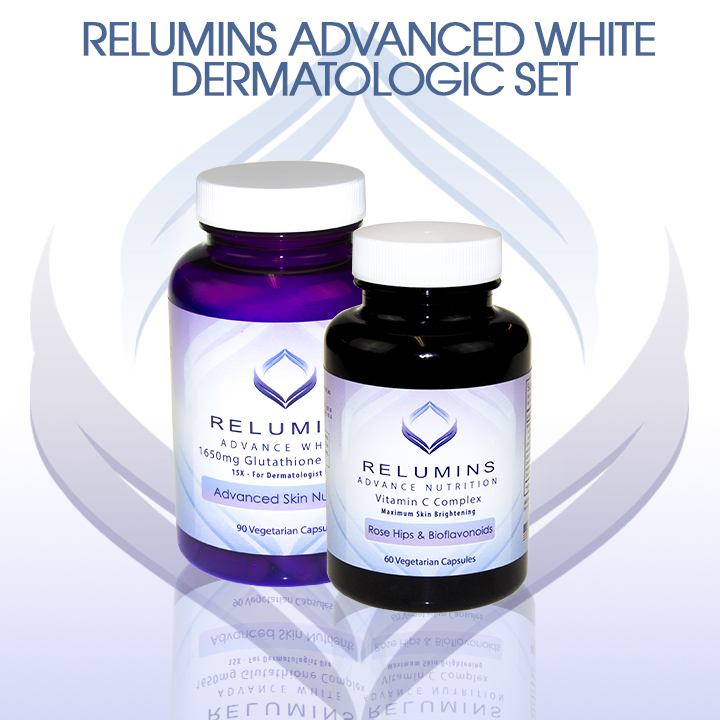 Containing a super high dose of glutathione and over a dozen supporting ingredients, this formula delivers on all fronts - whitening, anti-aging and general skin condition! 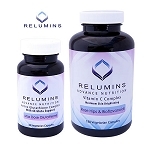 Relumins Vitamin C Complex - 60 Vegetarian Capsules (30 day supply), 100% Natural Brightening Supplement, Halal and cGMP Certified. 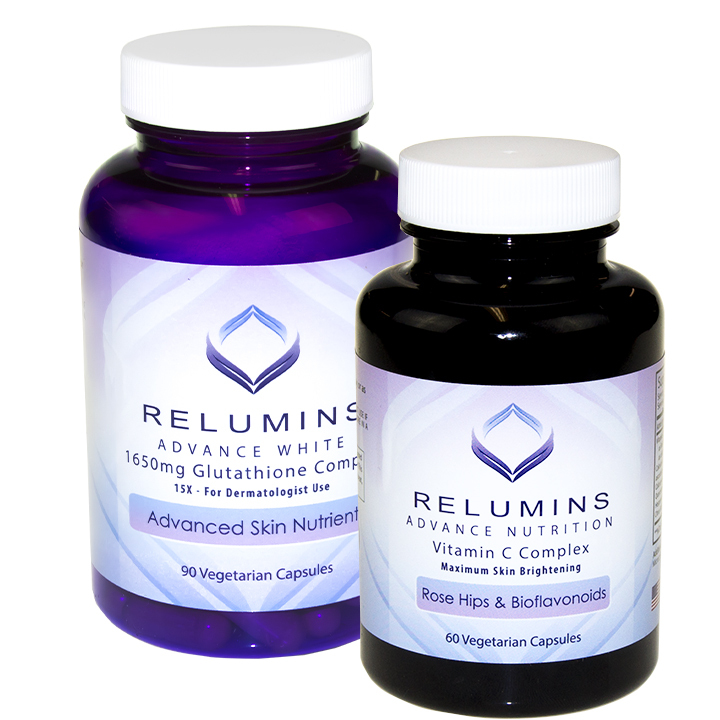 Vitamin C naturally supports glutathione levels in the bloodstream and helps your body use it more efficiently. 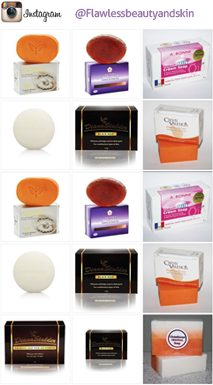 Its antioxidant properties neutralize the free radicals that cause skin damage. its been a while and am still loving it. I Know It takes time in more darker skin tones so am giving it time, yet I have seen much glow and improvement on my face and overall softer body, I think I look more sweet now. I will keep you updated. 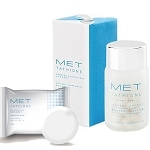 I have been using this product for 2 months now and I must say that my skin really lightens. 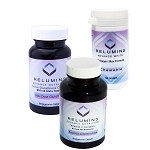 this product seems to work but needs a lot of patience,hope to see good results in three months when i finish all the three containers. stem cell intesive repaire is quit good just need something to use with it to moisture my skin more and dalfour beauty gold seal is ok as it moistures my skin and it lightens the skin to.the dalfour soap is the best it's not hush to my skin and its effective.dalfour beauty lotion is not effective as relumins advanced white. will update once i finish the capsules. fuzzy is a honest busness lady she always deliver my order as promised, but recommended me one lady from london who sales the same products online but she didn't want to refund my money until i contacted PayPal who managed to refund back my money. otherwise she wasn't gonna pay me back my £213.80 after one month of waiting Honey 21 is not a good business person my delivery was always late so i couldn't waint any more. 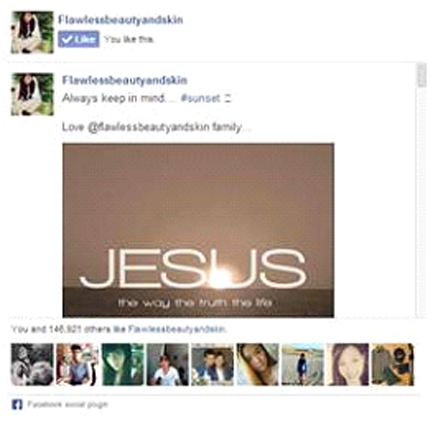 keep it up your honesty sweetsuzzy.